Howard Webb provided this image: "a real photographic postcard postmarked September 23, 1907. Publisher not stated." 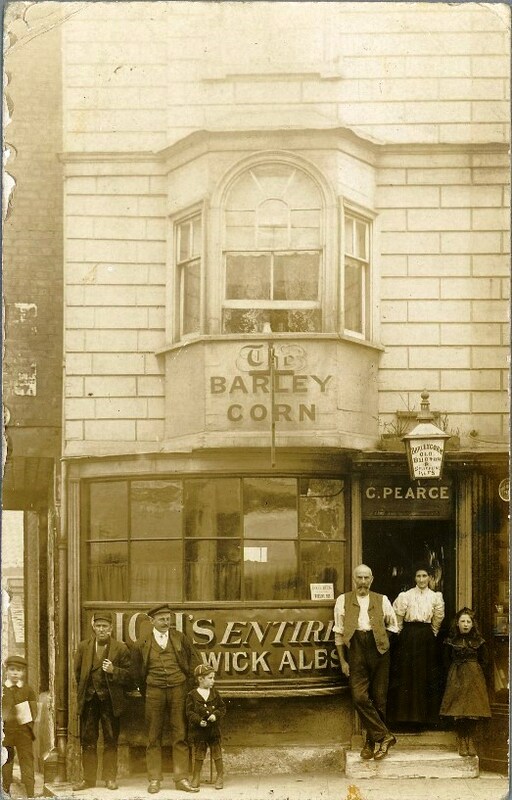 Fortunately Vic Rosewarne has researched the history of this beerhouse and provides the date when the licence was transferred to Corrnelius Pearce: 11 April 1907. Presumably the photo was taken shortly after Cornelius took over and it is he who stands in the doorway, with a woman and girl of 7 or 8 (his wife and daughter?). The window over the bay is open and Cornelius in shirtsleeves - a warm day. The white card in the bay window advertises 'Good Beds For Respectable Working Men'. Vic notes the tenure of the beerhouse was short, it closed at the end of 1908 having been deemed 'redundant'. As to the landlord, the 1901 census includes a C.J. Pearce in Catherine Wheel Yard, a brewers servant, age 40, unmarried, born in Brentford: possibly him. Another alternative has the correct name but was living in Shoreditch in 1901: he was a blacksmith's labourer aged 39 and born in Dover Kent. He had a family of seven children aged from 2 to 19 and his wife was Mary Ann, 41, born St George London. His daughter Mary, age 5 could be the child in the photo, although to me she looks a little younger than 11. The 1911 census finds Mary Ann widowed, a char woman, with her two youngest children from 1901 and a son, Frederick, born 1904 in Shoreditch. Their home was a Guinness Trust Building in Lever Street, St Luke's, London EC1. There is more online about the Guinness Trust Buildings but this going a a liittle off piste; it is not certain that this Cornelius spent a year or so at the Barleycorn. His death was registered in the second quarter of 1908 in the City of London, he was 47. The name Pearce was common in Brentford and the site has two pieces of research into families of this name: the first covers the descendants of Richard Pearce born 1792 - this line also had links to local pubs and beer houses (although there is no reference to a Cornelius); the second looks at Walter Pearce, postcard publisher in Brentford, born 1881. The card, like many communications by text, simply puts down a marker to say 'all is well' and it does not provide information about the writer, excepting their initials. As T Perkins was a friend rather than family the card could be written by a Pearce (although would the writer not have mentioned the beer house?). As the recipient was one of two or more friends it suggests T Perkins had or was part of a family and I would guess the writer was a woman. Of course, the card could be written by someone unrelated to the Pearce family. Turning to the recipient, wikipedia notes 'Hilston Park is a country house and estate located between the villages of Newcastle and Skenfrith, in Monmouthshire, Wales, close to the border with Herefordshire' and a Google search found 'Lodge House sleeping 10 is well positioned for activity groups for climbing, canoeing, mountain biking and walking.' Locating T Perkins proved more of a challenge. The 1911 census includes a Thomas Perkins at Cross Ways, Newcastle, 38, a waggoner on a farm; he was born in Skenfrith and had a wife and three children all born in Monmouthshire. The youngest child, Sydney G Perkins, was born in St Maughan's, and this is also where Hilston Park lay. The latter was occupied by Douglas William Graham, 45, a barrister born in Inchinnan, Renfrew, his wife, two daughters, visitor Arthur Grove - an architect, a governess, a butler, footman and large entourage of female servants. The house had 26 rooms and 15 occupants. The properties recorded next in the census were part of Hilston Park - an estate office and a farm - one of these may have been The Lodge but neither had a resident named Perkins. Back ten years to 1901 and the sequence of recording in the census was Crossways (occupied by John Howard, blacksmith, and family); North Lodge (Hilstone) (Thomas Stevens, river keeper and his wife), Stables (Hilstone) (John Turbill (Turvill? ), coachman domestic, wife, child and lodger); Hilstone Park - occupied by Douglas WIlliam Graham as in 1911. It seems possible that T Perkins found in 1911 is the card's recipient.